Want an industry-proven way to increase your revenue? Increase your frequency of visit (FOV)! If you’re unfamiliar with the concept of FOV, it measures the average number of times a client visits your business. For a salon, the industry average is roughly 4.88 times per year, but your FOV is also dependent on the services you offer at your business. Even though it’s a simple concept, frequency of visit is one metric that affects your business significantly. To understand the impact it can have on your bottom line, here is a projection using our ‘What If’ tool. 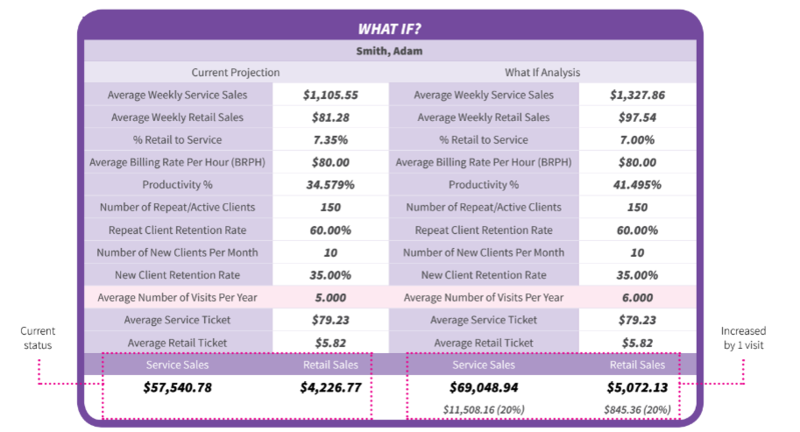 ‘What If’ takes a business’s current metrics and allows you to change different factors to see the effect on your revenue. So, what if a business JUST increases frequency of visit by one per year? Notice how just one more visit (from 5 to 6) produced 20% growth in service sales, going from $57,540 to $69,048. Did you notice anything else? Increasing visits has a side effect of also increasing retail. In this ‘What If’ scenario, retail grew 20% as well. Setting goals to improve your FOV can take your business to new heights. From extraordinary customer service to marketing to re-booking to implementing client loyalty points, there are several things you can do to make your clients excited to come back to your business. Curious about your FOV? Take our awesome business personality and money making quiz! Building customer retention and loyalty are essential to growing a thriving business. Tune in to our next Coffee Talk with Robert Cromeans, Global Artistic and Business Director for JPMS, as he spends the afternoon with our Founder and CEO John Harms to discuss how you can improve your Frequency of Visit. Register here and watch live on Wednesday, April 25 at 1 PM EST.